24 inch x 150 Foot Roll, Yellow Resin Coated Fiberglass Reinforcement Fabric with 20x10 Mesh. Meets ASTM D 1668 Type III. 8 Rolls/Case. Price/Case. Yellow Fiberglass Reinforcement Fabrics are designed to reinforce plastic roof cements, wet or dry elastomeric flashing cements and coatings. It commonly used in roof repair work, for flashings, and for sealing seams in metal and composition roofs. Can be used with either hot bitumen, cold coatings, asphalt, tar, and various resin coatings, cements and adhesives. Allows a high bitumen to fiber ratio to be achieved in a built-up roofing systems. Excellent repair fabric for both new and old construction in roofing and waterproofing applications. Other applications include: foundations, slabs, tunnels, subways, pipeline joint wrap, parapet wall treatment, tennis courts, plaza decks, HVAC, insulation and stucco. Yellow Resin Coated Fiberglass Fabric: Compatible with asphalt, coal tar cements/coatings, emulsions, solvent-based, and hot-melt type materials. Glass membrane / woven fabric, 2 oz., 20 X 10 mesh, made with flexible filaments of glass. Tensile strength: 75 lb/inch provides stability and durability. Will not rot or decay. High visibility yellow color: Enables applicators to confirm that coverage is complete. Aids in creating quality workmanship. Sizes: 4, 6, 9, 12, 18, 24, 36 and 48 inch widths. Embed fiberglass smoothly without wrinkles or buckles. Top coat fabric with roof cement (or coating) to the same thickness as the first layer, making sure the glass is entirely covered. CAUTION: Use gloves and other protective clothing when handling this product. 36 inch x 150 Foot Roll, Yellow Resin Coated Fiberglass Reinforcement Fabric with 20x10 Mesh, 1.6 Oz/Yard. Meets ASTM D 1668 Type III. Price/Roll. 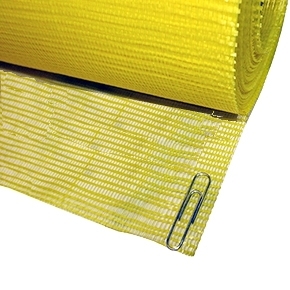 6 inch x 150 Foot Roll, Yellow Resin Coated Fiberglass Reinforcement Fabric with 20x10 Mesh, 1.6 Oz/Yard. Meets ASTM D 1668 Type III. Price/Roll.